You’ve heard of the power couple, well meet the latest craze – The Power Book Club. 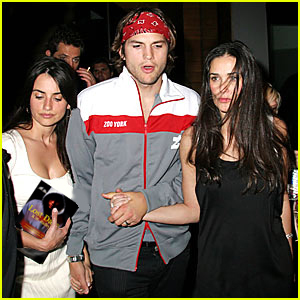 Ashton, his wife and everyone’s favorite Spaniard are seen here rushing to Meeting Room 2B at the Los Angeles County Public Library to talk about Lost Days with a couple of their other celebrity friends. I’m sure they tweeted about it. I’ll be there next week giving a class on Photoshop. This entry was posted in Lost Days Book, Lost Days Photoshop Celebrities and tagged ashton and demi, bigfoot, books for girls, cryptozoology, mrs. kutcher, penelope cruz, photoshop, sasquatch, what do celebrities read, young adult novels. Bookmark the permalink.